A második találkozó helyszíne a Nápoly-közeli Rionero in Vulture városában volt, ahol a résztvevők közösen dolgoztak a vállalt feladatok teljesítésében. A magyar vendégek a Vezúv és Nápoly látványa mellett sok más felejthetetlen élménnyel gazdagodtak. A vegyes csoportokban versengő diákok Gallipoli Cognato természetvédelmi területen térkép és iránytű segítségével tájékozódási feladatokat oldottak meg. Megcsodálhatták a vadregényes Basilicata régió híres barlangvárosát, Materát, ahol Pasolini forgatta a Máté evangéliuma vagy Mel Gibson A passió című filmjét. Útjuk során ellátogattak többek között Venosa és Monticchio településekre. Rionero városának az 1980-as földrengés után épített középiskolájában a négy nemzet képviselői bemutatták országuk városait, nevezetességeit, nemzeti parkjait a saját maguk készítette reklámfilm segítségével. Az eddig összeállított képregények, fotók felhasználásával kiállítást is rendeztek itt, az intézményben, tehát ilyen módon a tágabb közönség is betekintést nyerhetett a közös munkába. A házigazdák hangulatos műsorral kedveskedtek a vendégeknek, amelyből nem hiányozhatott a zene, a tánc és a helyi ételek sem. The arrival of groups in Naples. Project activity: Collecting materials about Italian tourist attractions for our common guidebook. Travelling to Naples. A tour with an English speaking guide. The records will be used during our work on common comic strips. 20.00 arrival in Rionero. Supper in Rionero or during the journey back. Collecting students by host families. A route around Naples with a guide. 18.00 departure for Rionero 20.00 arrival in Rionero. Supper in Rionero or during the journey back. Project activity. Presentation and workshop day at school. 8.00-9.00 Preparation of our "Posters" and other stuff. 9.00 - 12.00 The presentation displayed in front of the invited guests. Discussing the work on the second chapter of the guidebook and presenting the findings in a form of films, blogs, charts, comic books, photos. 2. 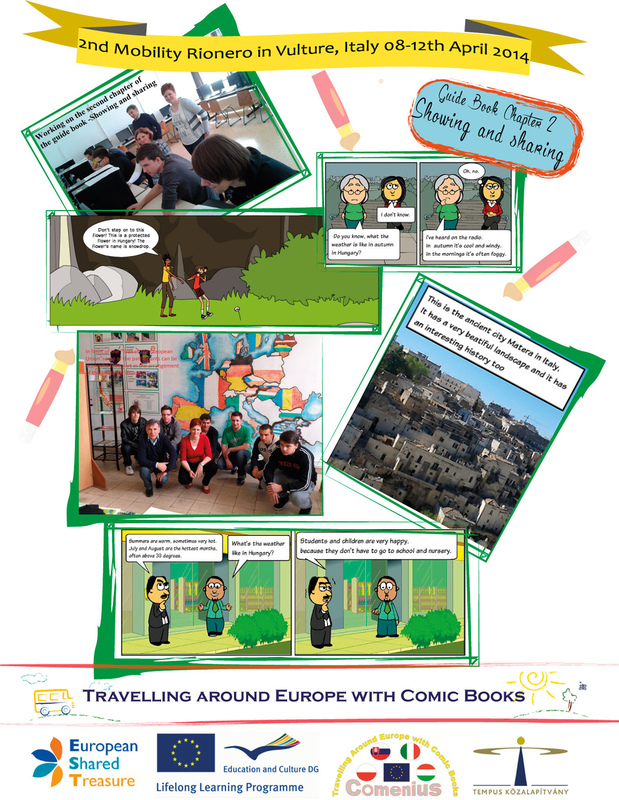 11.00 -13.00 Workshops- preparing common comic strips. Discussing the second chapter of a guidebook and teacher's Mobility. 13.00 lunch (at the restaurant or cafe) Project activity. Creating documents about our town monuments. A tour with an English speaking guide or Students taking roles of tour guides. 3. 16.00 - 18.00 Old town sightseeing: "Palazzo Fortunato" and its square with a guide. 4. Welcoming at "Palazzo Fortunato" by the Mayor of Rionero. 5. Students' dinner at the hotel restaurant or in the city. Project activity. Collecting materials for our common guidebook. Travelling to Gallipoli Cognato (National Park) and Matera. Common participation in tasks connected with tourist attractions and National Parks. Regional games and activities. 08.00 Leaving for Gallipoli Cognato by coach. 09.30 -11.30 Sightseeing the natural Park with a guide and sport activities for students (orienteering). 14.00 Leaving for Matera. A tour with an English speaking guide. The records will be used during our work on common comic strips. 16.00 arrival in Matera. A route around Matera with a guide. I Sassi: Sasso Caveoso and Sasso Baresano, the Cathedral and Tramontano Castle. Free time for walking around the Main Market Square. 21.00 arrival in Rionero. Students and teachers' dinner at a hotel restaurant or in the city. Project activity. Collecting materials for our common guidebook. Travelling to Monticchio, Melfi and Venosa. A tour with an English speaking guide. The records will be used during our work on common comic strips. Tourist attractions, Nature and conservation. 8.00 Teachers' Mobility - discussing the project work. 8.00 Leaving for Melfi, Monticchio. 8.30 Arrival in Melfi. A route around Melfi with a guide. Sightseeing the Castle of Melfi with a guide, the Archeological Museum, the Norman Walls, the Cathedral, the Episcolo. 11.30 A route around the lakes. Students taking roles of tour guides. Sightseeing the Abbazia and Museo naturalistico. 13.00 -15.00 free time for lunch. 16.00 Arrival in Rionero and free time. 19.00-21.00 Greeting Party and photos showing.